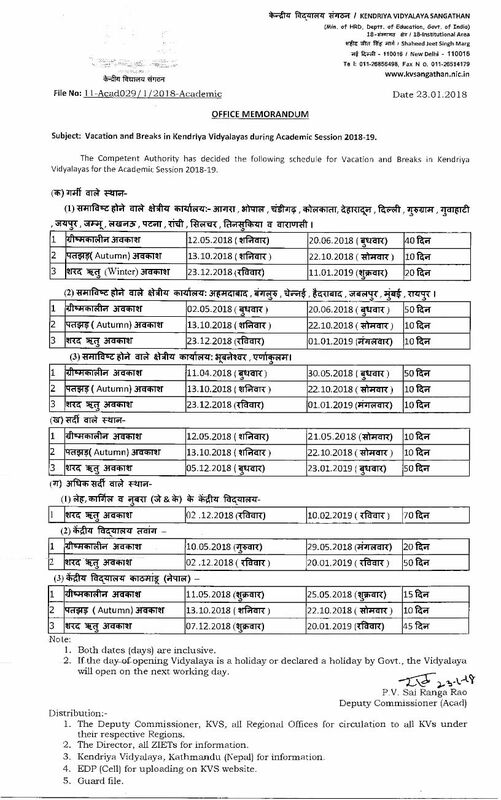 The Competent Authority has decided the following schedule for Vacation and Breaks in Kendriya Vidyalayas for the Academic Session 2018-19. (क) गर्मी वाले स्थान . 1. Both dates (days) are inclusive. 2. If the day of opening Vidyalaya is a holiday or declared a holiday by Govt., the Vidyalaya will open on the next working day. The Competent Authority has decided the schedule for Vacation and Breaks in Kendriya Vidyalayas for the Academic Session 2018-19.